We Are Loving Lacey And We Couldn’t Be More Proud! This isn’t the first time I’ve written about our daughter Lacey on this blog. 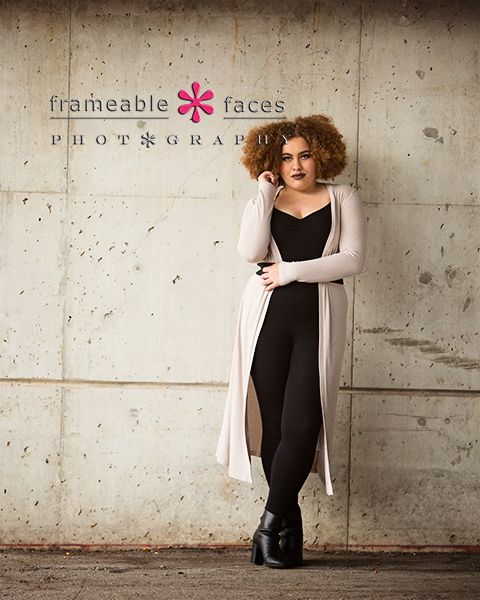 She represented our studio this year as a senior spokesmodel and we already did one epic session with her in downtown Detroit. 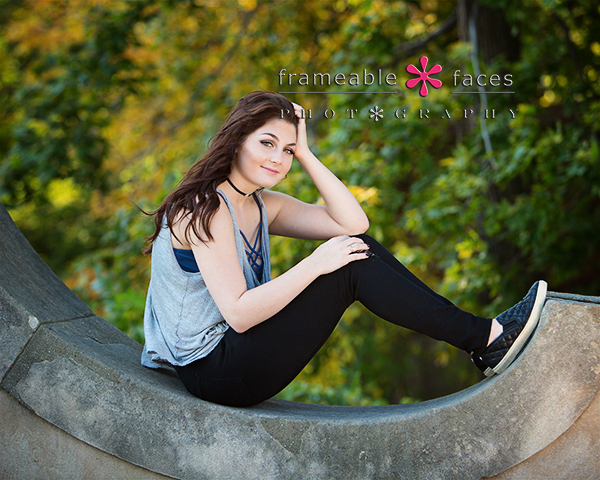 This time around it’s her senior session and it’s a good thing I’m writing this post because if Ally tried she’d probably be an emotional mess. It goes fast – really fast, and here we are – it’s been 17 and a half years that we’ve been loving Lacey and we couldn’t be more proud! Of course we have some fun behind the scenes for you first from the replay of the Periscope live stream broadcast. If you want to be a part of future broadcasts and haven’t downloaded the app yet you can do so and follow us at @FrameableFaces at this link, or if you prefer to just watch from twitter you can do that here. 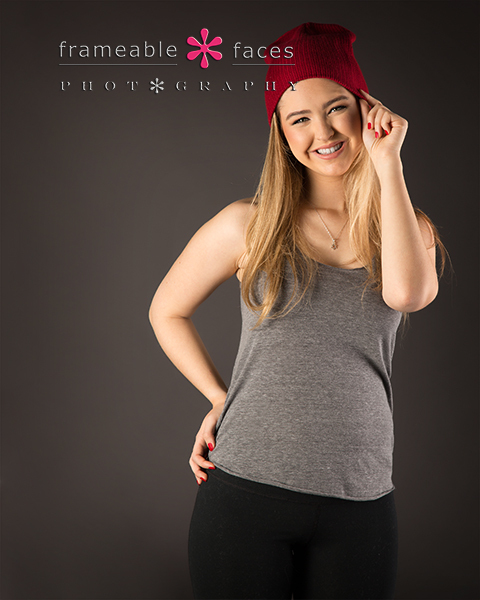 Here’s one more from the studio of Lacey with a cute red hat! At this point it was time to head out and get some fall colors on this nice crisp November day of which there were some great ones! Here’s another broadcast replay from the location – this time on Facebook Live! 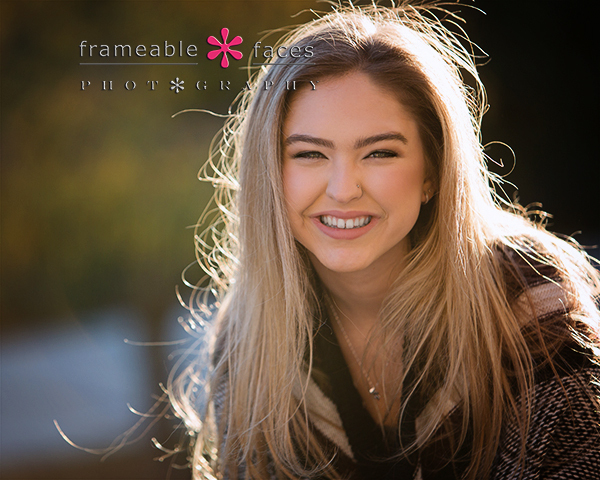 I’m biased but I do love that smile… So yes we are loving Lacey and always will be. 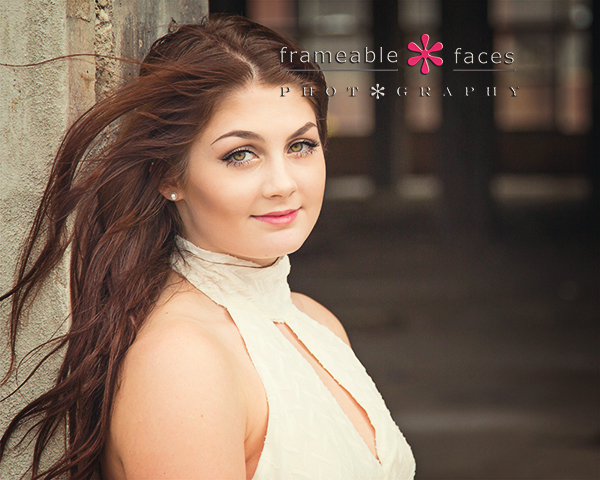 Don’t be surprised if there is yet another session (or two) of this girl before her senior year is done. Ha! We hope you enjoyed the highlights of our day with our girl! Hair Jordan! As In Her Hair Is Amazing And So Is She! This blog title wrote itself – it’s impossible to look at a photo of Jordan and not be struck by her amazing hair so I had to do it. You’ve heard of Air Jordan I’m sure – the brand is supposed to represent excellence right? So “Hair Jordan” is certainly a good thing! 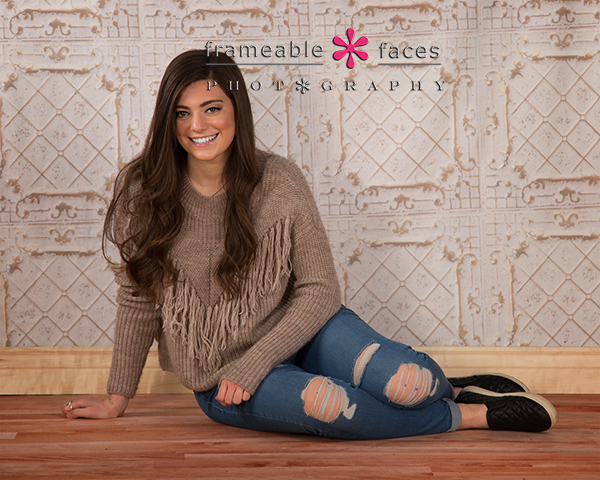 And the rest of her is pretty awesome too – we were impressed with this girl from the first time she came to the studio for her consultation with her mom Julia. 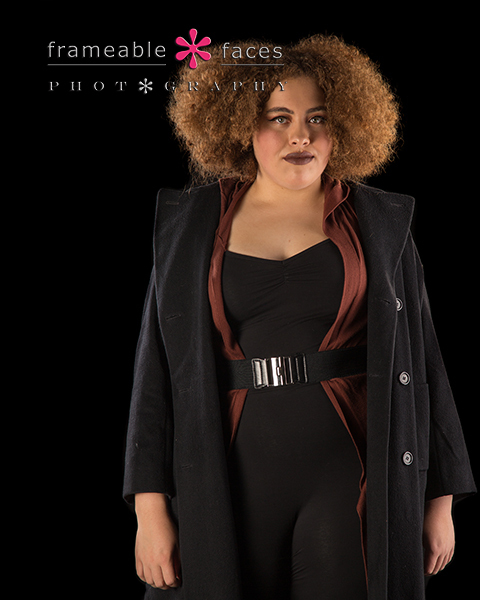 Just a cool confident teen and we look forward to the heights she’ll scale in the future. 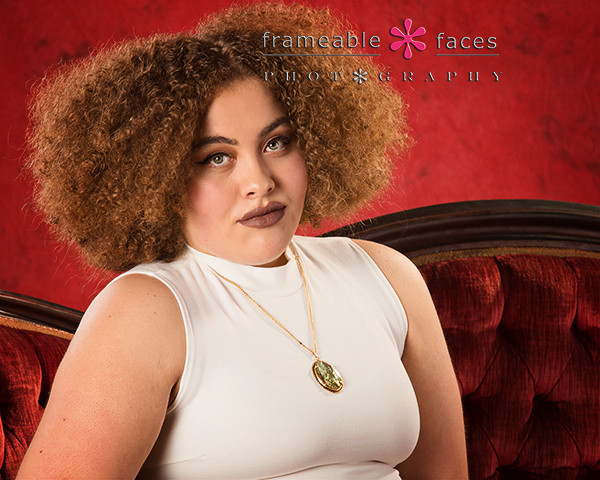 Okay – loving it all – Jordan’s skin tone and hair with the red couch against the red background? Amazing! We also have some fun behind the scenes of the session for you starting with the replay of our live Periscope broadcast from the studio where we were making the above photo. If you don’t have the app yet you can download it and follow us at @FrameableFaces at this link or if you just want to watch from Twitter you can do that here. At this point we headed to Pontiac to get some city photos – half painted walls, underneath parking garages – we love this stuff…. Here is a little more behind the scenes action – this time from Pontiac on Facebook Live! And one more from the city! I actually spotted this wall. 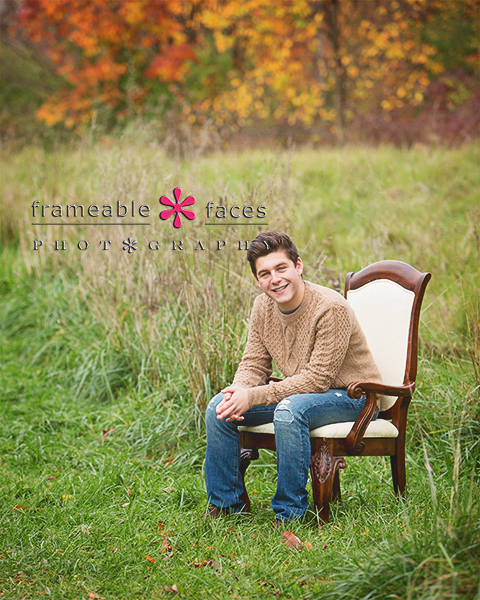 We’ve really closed this fall out strong with our seniors from the standpoint of finding bunches of new spots! We had never seen this wall before and it will now be “Jordan’s Wall” because that’s how we roll. 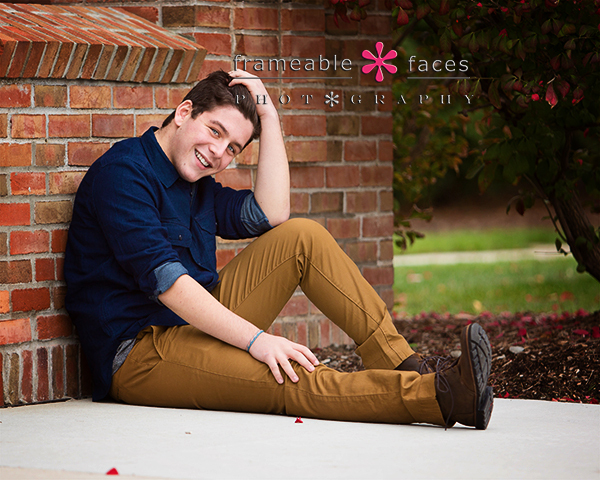 Wow – in love with Jordan’s session!!!! “Hair Jordan” indeed! That’s all we have for now – we hope you enjoyed the highlights of our day with her! 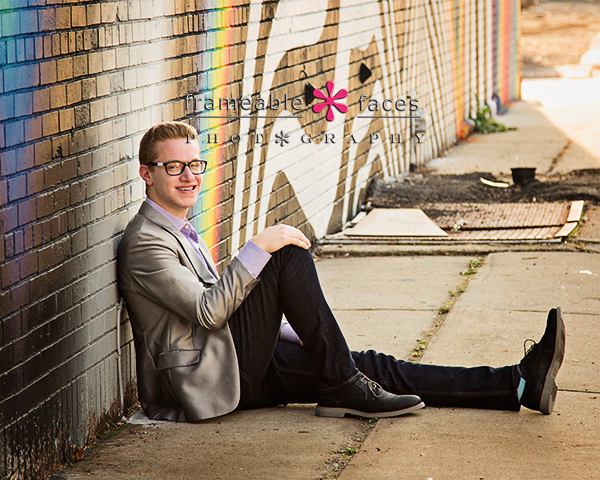 A Perfect Day Of Surreal Proportions For Jeremy’s Senior Session! Here is some fun behind the scenes from our day starting with a replay of one of our live broadcasts on Periscope! You can be a part of our future shows by downloading the app and following us at @FrameableFaces at this link or you can just watch from Twitter here. 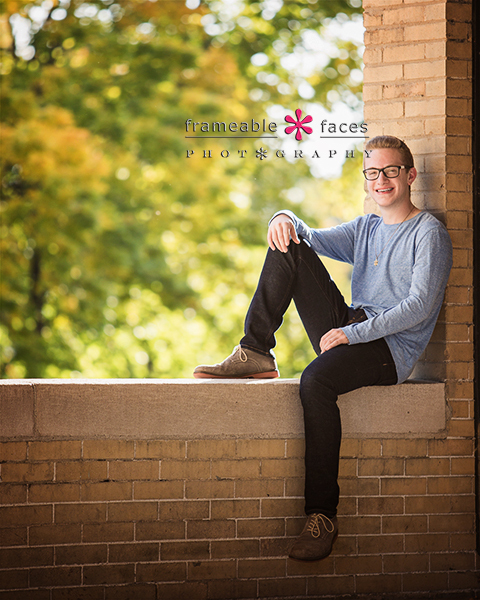 Soooo cool… what a stud! …and here’s one more mural shot. And here is the last one as the sun was about to vanish on the horizon – and while it is a finished image, Ally did not mess with the color – that sunset sky is #NoFilter! A perfect day – as it was finishing up we just kind of reveled in the satisfaction of an amazing session and the crazy way in which it all came together! Karen was thrilled to be a part of it, so were we, and Jeremy nailed it! A perfect day of surreal proportions and we hope you enjoyed the highlights! 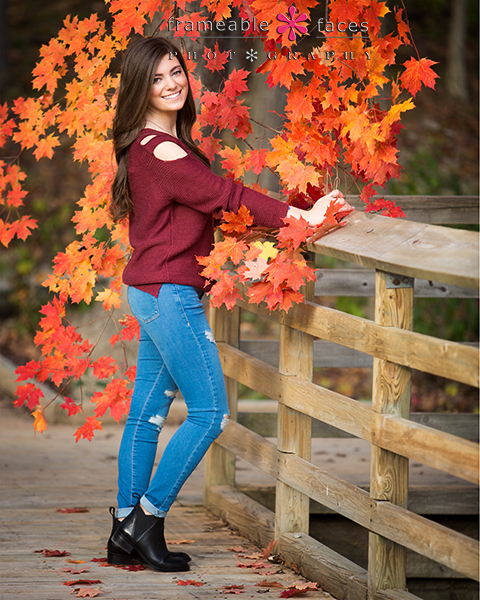 Pure Hannah, Pure Michigan Fall Colors, Pure Awesome! We also have some behind the scenes fun here – first with the replay of our live Periscope broadcast from the studio and you can join us and be a part of future broadcasts by downloading the app and following us at @FrameableFaces at this link, or you can just watch from Twitter here. Love that background with the ripped jeans! 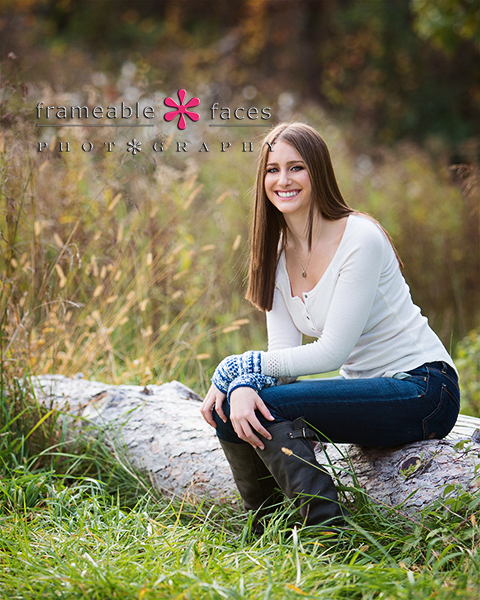 And here is the final sneak peek for now – fittingly a photo of just pure Hannah! And there you have it! Pure Michigan, Pure Hannah, Pure Awesome! We hope you enjoyed the highlights of our day! 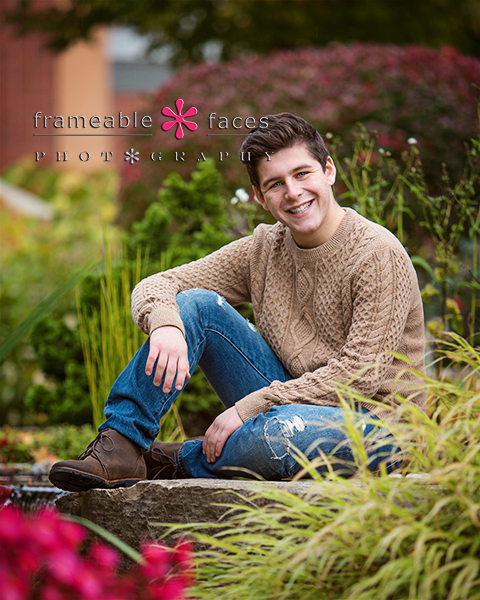 Bruw-ing A Stellar Senior Session With Max-imum Results! So of course this title is a play on words right? 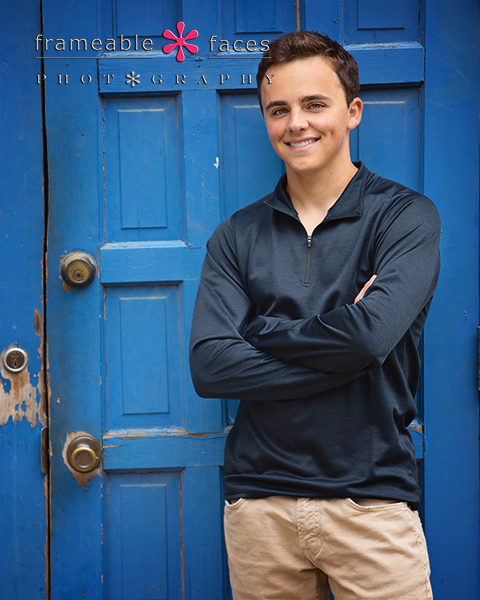 Well it’s because this stellar senior session features Max and he’s been here in the studio before….with his coffee beans and his cold BRUW filter which is his very own company! 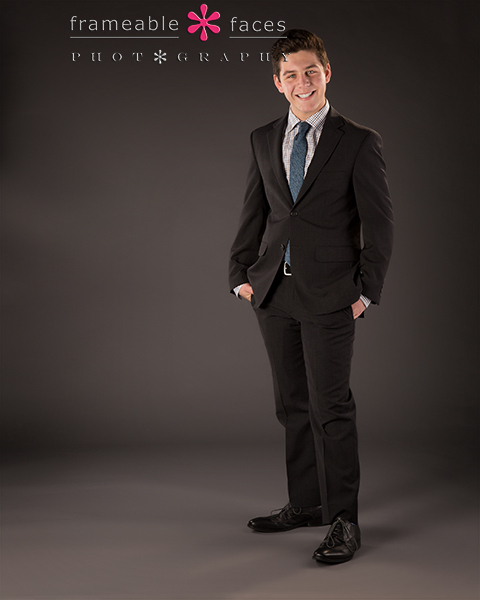 This enterprising young entrepreneur is getting it done and you can check out his website along with a few photos by US at www.bruw.net! We also have some behind the scenes fun for you first with the replay of our live Periscope broadcast in the studio. If you want to be a part of our shows there you can download the app and tune in at @FrameableFaces at this link, and if you just want to watch from twitter you can do that here. 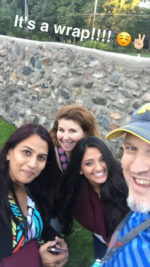 One more Periscope replay for good measure (we were having a lot of fun)…. lol! And one last photo of Max – and just as the rain started to fall too…. good timing! And there it is! 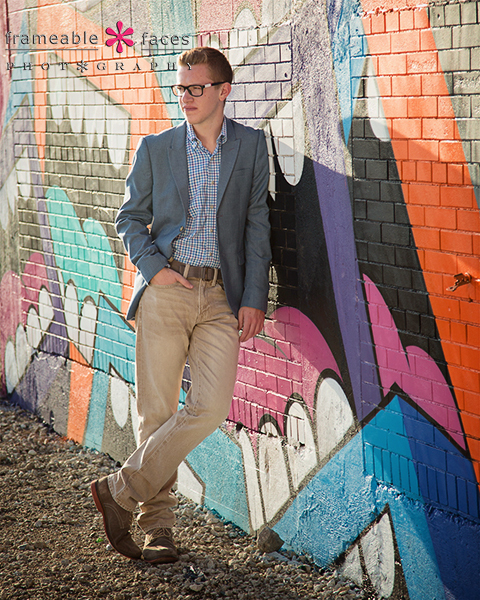 We BRUWed a stellar senior session with Max for sure, and we hope you enjoyed the highlights of our day with him! 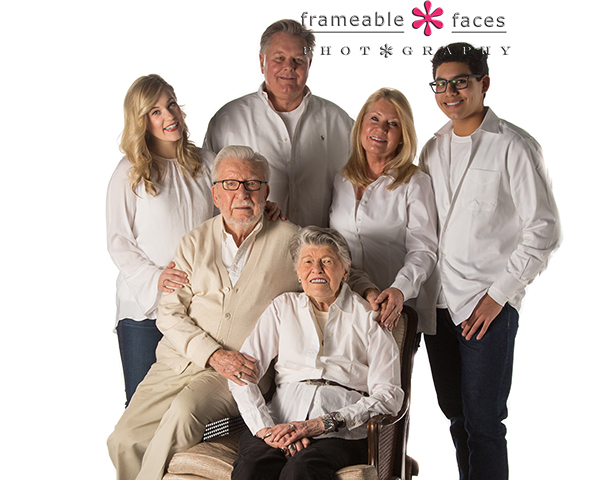 A Magical and Multigenerational Family Session (and 67 Years Of Marriage)! 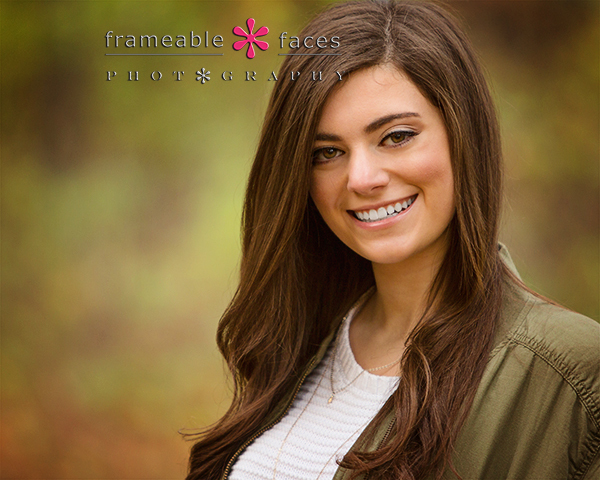 This is so awesome – Cheryl just popped into the studio asking if we could shoot here in a week if she could pull everyone together since everyone was in town, and we had an open time slot so it worked out! And what a magical multigenerational family session it was!!! Cheryl’s hubby, wonderful kids, and parents who have been married for SIXTY SEVEN years were all here and this was surely special. We also have some behind the scenes fun too – here’s our replay of the live Periscope broadcast we did – you’ll love this. 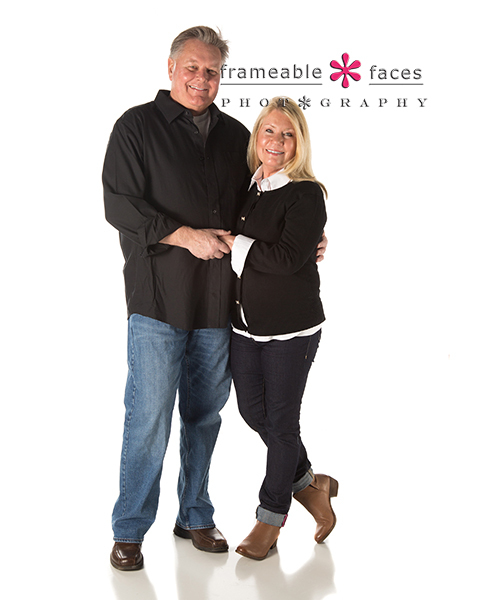 If you want to follow us and be a part of our broadcasts you can download the app and follow us at @FrameableFaces at this link or you can just watch from twitter here. 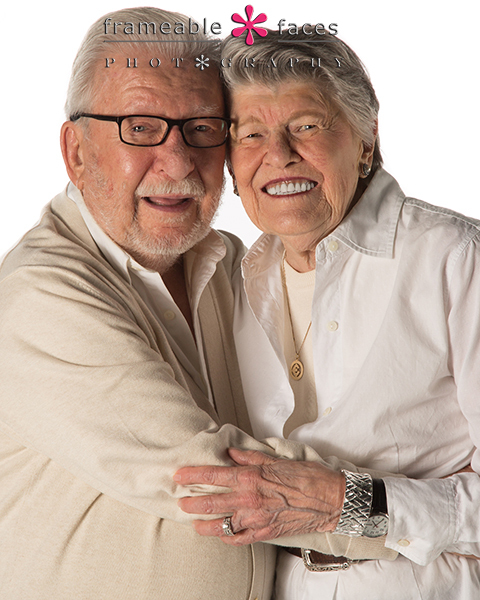 67 Years and So Cute and Happy! So this is what 67 years of happiness looks like. How cute are they….? Moving right along to the other happy couple in the room, here’s Cheryl and her hubby Larry! And lastly the awesome siblings! Lauren who is a Broadway actor & Cameron who is a high school student! And there you have it! Cheryl pulled them all together and we made it happen – a truly magical and multigenerational family session! We hope you enjoyed the highlights! Oh My Maya! 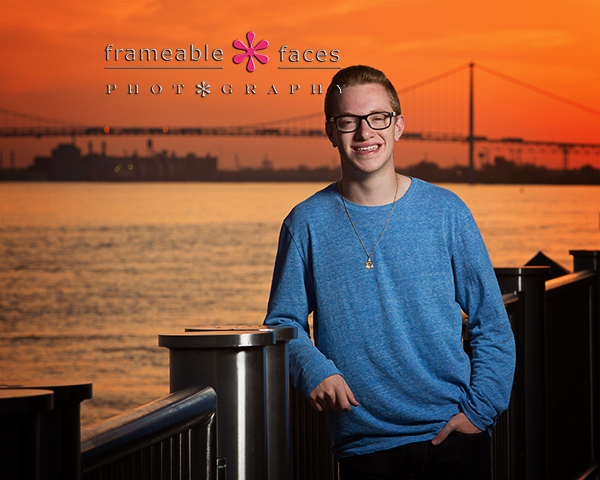 Yasss This Senior Session Was Quite Memorable! Oh my Maya! 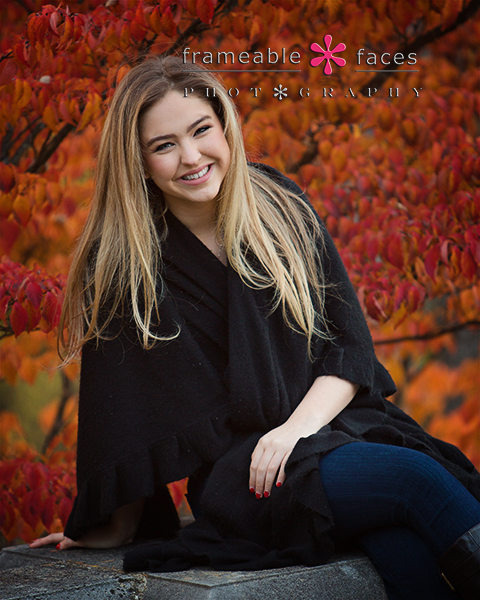 That’s what these photos will make you want to say out loud since Maya killed it on her senior session! 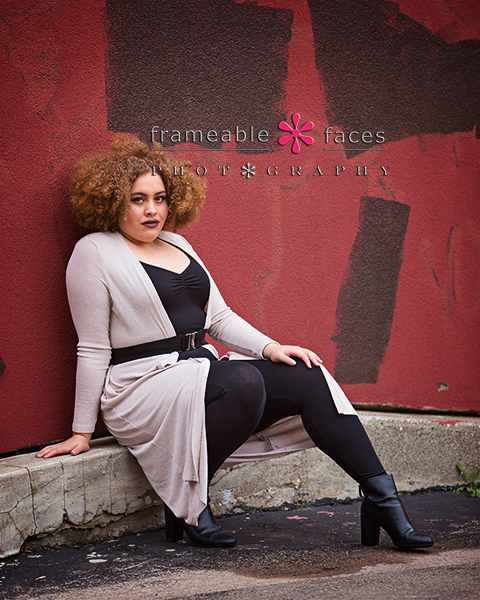 You may remember Maya’s spokesmodel session in Detroit from earlier this year since she represented our studio for the class of 2017, and we love when our spokesmodels return for their senior session! 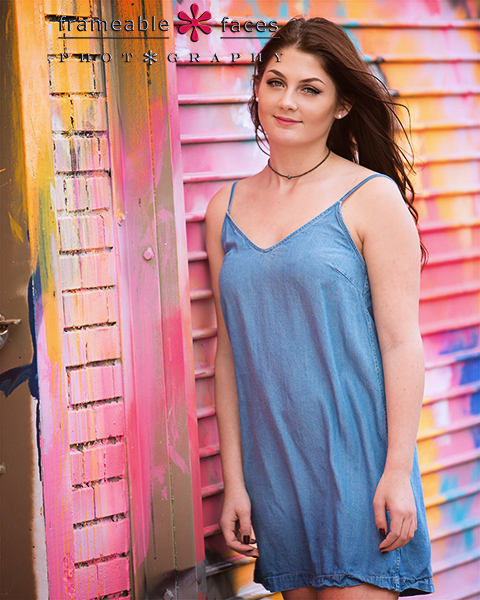 You see, the spokesmodel session is kind of “our session” to try out new spots, backdrops, styles and trends, while the senior session is “their session” to do whatever they want! In Maya’s case the plan was to get more of a fall session so we headed outside in October to do just that. Maya’s mom Julie joined us and we had a great time, but before we head out on location let’s take a look at a studio photo on the black background with Maya sporting her figure skating gear! Very nice! We also have some behind the scenes action for you from the day, first with a broadcast replay from the studio on Periscope – if you want to be a part of our shows there you can download the app and follow us at @FrameableFaces at this link, or if you just want to watch from Twitter you can do that as well here. Conditions were just perfect and Maya looks fabulous! Let’s take a look at some more behind the scenes this time from Facebook Live! So cute! And there you have it – oh my Maya!!! We hope you enjoyed the highlights from our day with her! Yes. Photography blows. We should know better than anybody – we’re photographers. 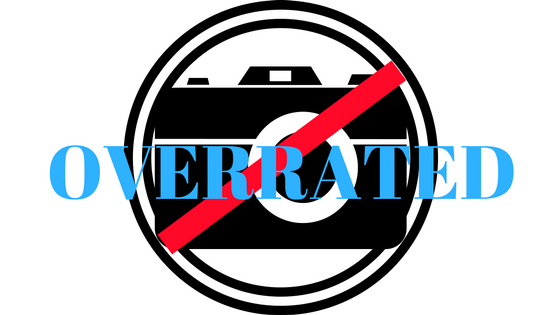 Through extensive research we have compiled the 21 reasons why photography is completely overrated. Narcissists aren’t cool in general and photography gives them an outlet to be….narcissists. The awkward moment where someone is trying to imply that they want to take a picture of the rest of the group who have something in common that you don’t really have with them. I mean, it makes sense but still totally awkward. So there you go – 21 reasons photography is completely overrated! Feel free to add more to the list…. 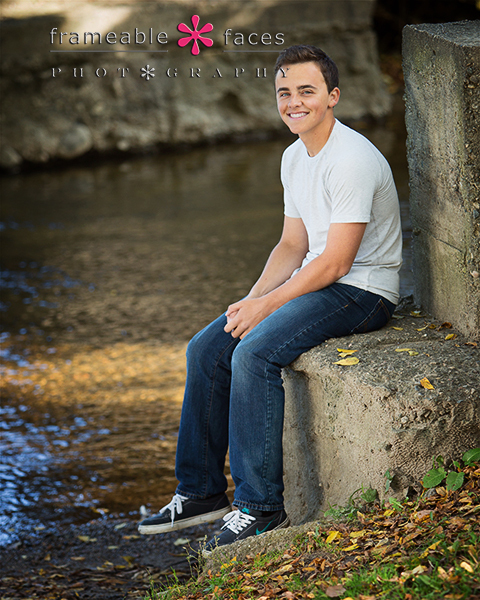 Ben Is Back And His Senior Session Was Another First For Us! Yes Ben is back! 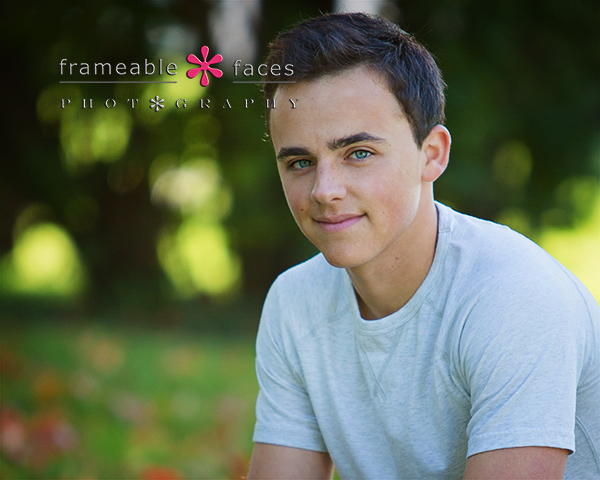 You may remember Ben from his spokesmodel photos representing the class of 2017 back in May, and now it’s time to share some highlights from his senior session – what was cool about this session (aside from Ben himself and his mom Gina who is a friend of ours) was that like the previous senior we just posted it was marked by a new location for us. 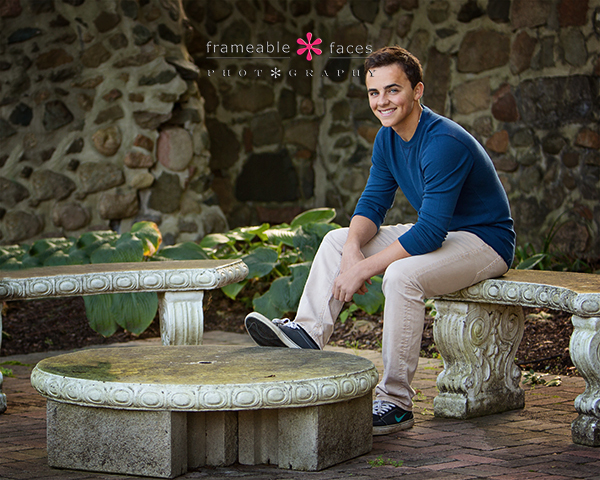 We had heard about Shiawassee Park in Farmington and driven past it over the years but we never thought to shoot there. Well we can say now that it’s really nice and this was a great first for us! Cool huh? What a cool dude. We also have plenty of behind the scenes fun from our day and while we are focusing on the location photos from the session here we also spent some time in the studio which you can see from this replay of our Periscope broadcast. 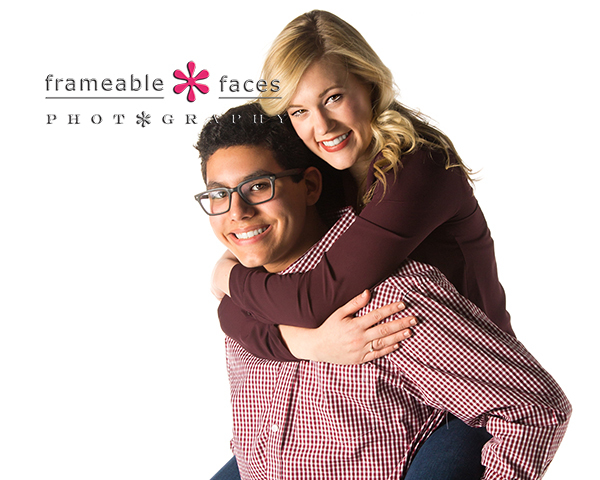 You can download the app and follow us there at this link, or you can just watch from Twitter at this link – either way be sure to follow us at @FrameableFaces! So awesome!!! Ben and our daughter Lacey are pretty close friends so we know Ben pretty well and we were having fun at this point! Ben is a cool guy too – he’s a pilot! Yes – of planes…! Here is the other behind the scenes broadcast we have to share – this time from Facebook Live! And that’s it! Ben was back and in a big way – awesome times and a great session with this guy. We hope you enjoyed the highlights of our day!